DOES THIS ARTICLE SAY THAT? Please click on the link here for a MarketWatch article. I think this guy is more bold in preaching his message than I am even though we are in total agreement. (Perhaps I have a softer way of speaking?) It's interesting to read from my perspective because I'm sitting here nodding my head as I review it, but at the same time I am shaking my head saying to myself...."this guy sounds like a whack job!" I guess now I know how many people feel when they read this blog. I do try to balance the information with a good dose of bearishness sprinkled in with a picture of what could be different if I'm wrong. I also try to highlight trend changes and things that demonstrate that improvements could be coming. So, this guy doesn't mess around, just drops it in our laps and says get ready. Personally, I think we have about 10 to 15 days to prepare (meaning market advance higher) and then it begins to crumble in earnest. This is about the amount of time we've had between flash breakouts of new credit concerns in the Eurozone. 10-15 days is enough to lull one to sleep to get your portfolio blasted.. Don't say we (or the credit markets) didn't warn you. Oh yes, and if you are thinking that the new "Son of Stimulus" that is being thrown about by the Obama Administration is going to help us, you can think again. $200 Billion in newly printed, errrr... wasted dollars won't do anything but give some government worker a job for a month or two. I found an interesting chart to examine. This is the 1 week-Libor rate (or the rate in which banks lend to each other overnight or in this case a 1 week rate). Basically this is the level of trust between banks as each needs different levels of cash to support operations on a daily basis. If they have money left over, they will lend it to others at the specific Libor rate for that time period. As you look at this rate you must discern what the "normal interest rates" are for the current period, meaning that comparing today's Libor rates against that of 2007 will show that Libor rates are much lower now, but remember the economic climate back then was that we were coming out of a recession in 2002 and 2003 and the Fed had raised interest rates and their really was a global bull market in place in all assets - stocks, bonds, real estate markets and everything else were roaring. What is interesting though is to examine the rate conditions on a very short time frame to see what is happening to examine stress in the market. Currently the 1 week Libor rate is at .32% or 32 basis points (1/3 of 1 %). Doesn't sound like much does it? Well, it isn't as it is a direct result of the low overnight funding rates provided courtesy of central bankers that want to pump liquidity into the banking market. Central bankers manipulate overnight lending rates in an effort to drive down borrowing costs in the front end of the curve and stimulate economic activity. 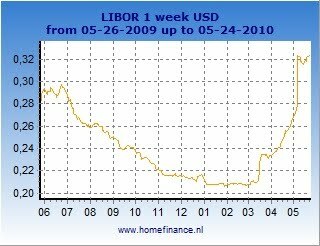 What is interesting though is that we examine the movement of the 1 week Libor over the last couple of months. Despite promises of a trillion euros of liquidity and support for country debt, we see an escalation of prices or a corrosion of confidence between banks. While these rates are NOTHING like we saw in October of 2008 in the Lehman and Bear Stearns crisis, they are elevated and signaling trouble. THESE NEED TO BE ON OUR RADAR as this was one of the key metrics that allowed me to pull all of my money out of the market in December of 2007. Note also that this is the highest rate for 1 Wk Libor in more than 1 year. If this rate begins to recede, great, but if it doesn't it will be cause for further concern regarding a credit meltdown. And it is the fixed income market that pre-warns of stock market weakness. If I have time I'll create some of my own charts and compare these rates to FF rates. 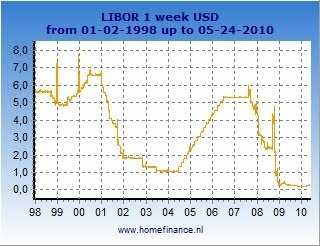 In the mean time, this is a 12 year chart of 1 week Libor that shows that despite the big % move up in the last 3 months, we are still at historic lows. You might say, "Well look, we are so low what's the worry?" The answer is the change in rates on a % amount is signaling that there is a risk in the market. We need to understand that risk and identify it. Oh, and by the way, Spanish sovereign debt had a little trouble this morning and they last issued debt at 73bps, guess what - this week they funded debt at 126 bps. This means there was greater than a 50% increase in the cost of running and funding their government. Try to do that with your bills at home and see how long that is sustainable. Just another warning sign. Spain is next up, Portugal next, Italy, etc with Japan as the next debt crisis within 3 years. This is ugly and about to get uglier no matter what the stock markets do over the next week or month. I would sell all rallies especially if we climb 10% or so, in fact I'm praying for that kind of rally.